You are currently browsing the tag archive for the ‘embroidery hoops’ tag. Since finding the photo of Liberty of London fabrics framed in embroidery hoops at Purl (see post here), I’ve been meaning to try the idea. 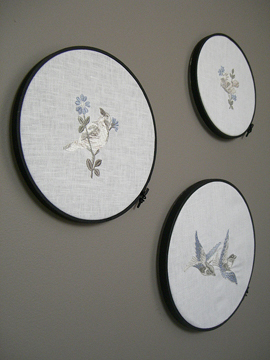 Here’s my interpretation with some embroidered birds on linen. I painted the hoops matte black. But I think that these would be great unpainted or painted with different bright colors and used in a child’s room. I simply hooped the fabric and cut the excess, so this was a quick and easy project. I plan to add more to this grouping, mix in some plates or find some flea-market style small round mirrors. I embroidered the birds myself, but I think that vintage handkerchiefs would make a great display. You can find lots of vintage handkerchiefs online here and here.